41! + 1 is prime. The sum of digits and period length of the reciprocal of 41 are equal. The number of whacks accused murderess Lizzie Borden allegedly gave her father on August 4, 1892, in Fall River, Massachusetts. She was acquitted of the murders of her father and stepmother, and the house where the murders occurred is now a bed and breakfast. The smallest prime such that the sum of factorials of its distinct digits is a square number (4! + 1! = 52). There are exactly 41 odd terms in the Collatz (or 3x+1) trajectory for 41. 41 + 14! is prime. Sum 41 is a video-obsessed pop punk band from Canada. The smallest half-quartan prime: p = (x^4 + y^4)/2. Kent leg spin bowler Tich Freeman conceded 4879 runs in 1929 and 69577 runs in his full career. 41 is the largest prime factor of 4879 and the smallest of 69577. There is a 41 Gun Royal Salute in London for a Royal Birthday, a Royal Birth, the State Opening of Parliament, and the arrival of a foreign Head of State or Commonwealth Prime Minister. Captain Cook lost 41 of his crew to scurvy on his first voyage to the South Pacific in 1768. Prince Judah, the title character in the epic film Ben-Hur, is reduced to oarsman number 41, a nameless slave on a Roman battleship. The smallest prime that is not the difference between powers of 2 and 3. 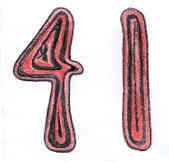 41 is the smallest prime number to have the same period (five) in both decimal and hexadecimal number systems. The prime number 41 is the record number of matches played by a player in an English cricket season (Bobby Abel in 1902). The 41st Mersenne to be found = 2^24036583-1. George W. Bush's nickname for his father, George H. W. Bush. In the movie "North by Northwest," a crop-dusting airplane attempts to mow down Cary Grant at Prairie Corners on Highway 41. There is an END-41 sign just south of the southern entrance to Yosemite National Park. The 2nd century sculpture (sphere) of the kneeling god Atlas depicts 41 of the classical Greek constellations described by Ptolemy. New Yorker Nicholas White was trapped in an elevator for 41 hours. J. M. Bergot asks, "Is 41 the least prime allowing for the most consecutive primorials to be added to it which give primes in all cases?" In an era before calculators, C. L. Dodgson (Lewis Carroll) summarized his work on simplifying ordinary arithmetical calculations in Nature, which included division by 41.